The Grand Prix circus gathered in Portugal three weeks after Peter Collins's fatal accident at the Nurburgring and Enzo Ferrari (who had lost Luigi Musso a few weeks before Collins) decided not to replace the English driver and so ran only two cars for Mike Hawthorn and Wolfgang Von Trips. The Vanwall team was stronger than ever with Stuart Lewis-Evans setting the fastest time around the Portuguese street track, which featured cobbled streets, tram lines and lamp posts. 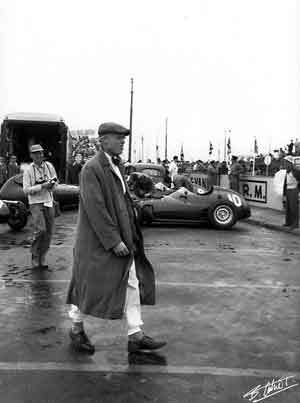 Hawthorn was second fastest and Stirling Moss completed the front row in his Vanwall, while Tony Brooks and Jean Behra (BRM) shared the second row and Jack Brabham (Cooper), Harry Schell (BRM) and Von Trips were on row three. It was wet on race day but the track was drying when the race began and Moss got ahead at the start. Hawthorn was briefly in front before Moss reasserted himself and began to pull away. Behra was third. Hawthorn stopped for attention to his brakes and dropped behind the BRM but Behra's engine began to misfire and Hawthorn soon regained second place. Behra would then slip behind Lewis-Evans as well.